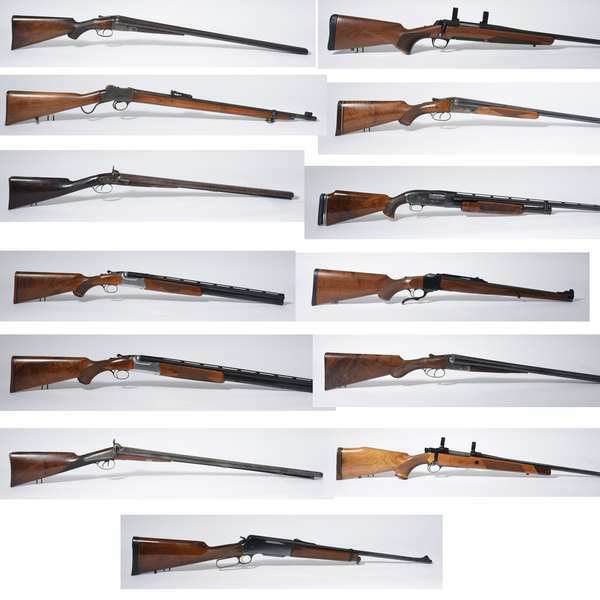 Featuring Antiques, Mission, Mid Century, Modern, silver, sporting related, antique and collectable firearms. Accessories: Many early door stops; several early duck decoys including pintail; early game boards; early samplers; early treen and wooden ware; blue decorated stoneware; folk art bird house; sheet metal weather vane; carved wood eagle; 2 vintage gum ball machines including Ford; Syrup dispenser; Singer featherweight sewing machine; vintage adv. signs including barber shop, De Laval porcelain; and others; antique stained glass window with Harvard College emblem; marble pedestal; doll house; Edison Home phonograph; pineapple hitching post; old violins; early butter stamps; good sleigh bells; old blue painted firkins; early silhouettes; several boxes of toy trains including American Flyer; large 58” regulator wall clock; Vienna regulator clock; crystal regulator shelf clock; old Victorian and other lighting; other clocks; many old signs including 8’ “look out for the locomotive”; Buddy L ladder truck and Express line truck; ship model in case; surveyors transit with tripod; ships wheel; old game wheel and more! Art: large 19th C. oil Indian encampment; vintage oil paintings sporting scenes; oil E. Anderson carnival; 4 abstract oils by Eve Wasser; great Winchester print adv. prints dogs; Old West and Rodeo print Jo Moro 1833; Hercules Powder calendar; KY Whiskey Adv. ; selection of good signed hunting and sporting prints including Leonard Danchin; 2 oils signed Helen Haye Brooks; oil by Hector Salas; 1837 fracture; various Japanese woodblocks; 1860 rolled map US; other VT and NH maps; 2 early Audubon’s; Currier and Ives; signed S. Dali; etc. Fishing: several split bamboo fly rods by Hardy, Leonard, Orvis and others; selection of fishing reels including Orvis fly reels; several lots of antique fishing tackle; early Orvis including minnow trap with box; fishing creels; fly fishing related many lots sold as collections and lots more! Over 500 lots sold in a random format (no catalog) and unreserved!